‘Believe me, I do understand that. And let me tell you — from one monster to another — that just because somebody tells you you’re a monster, it doesn’t mean you are. Cuckoo Song opens when eleven-year-old Triss, the eldest daughter of the Crescent family, wakes up after an accident. Triss vaguely remembers falling into The Grimmer (a pond near the holiday cottage where she’s staying with her family), but that’s all she can recall about her accident. She knows, however, that something isn’t right. Every now and then she feels “all the little patches and pieces of how-to-be-Triss that she had been carefully fitting together […] coming unpinned again”. Furthermore, she’s ravenously hungry all the time, her sister Pen is terrified of her, and her parents’ thinly disguised concern nearly smothers her. Triss knows she must find out the truth about what happened to her — but doing so uncovers a story stranger than anything she could have imagined. Here’s what I can safely tell you about Cuckoo Song: it’s set in the 1920s; it deals with a family grieving for their dead son and with a world that has had “its foundations shaken” and is slowly readjusting to all the social changes WW1 hastened; it combines its historical setting with fantasy and folklore elements in brilliant and unexpected ways; it’s very much about women trying to break free from the narrow roles imposed on them; it portrays difficult family dynamics with compassion and insight; it features a wonderfully complex relationship between two sisters; and it is, for the first third of so, utterly and completely terrifying. I keep going back and forth on whether I can say with absolute confidence that this is Frances Hardinge’s best novel to date — not because I have any doubts about how brilliant Cuckoo Song, but because I keep remembering that the rest of her work is also extraordinary. I can tell you with full certainty, though, that this is a fine example of Hardinge on top of her game, and that it would make a great introduction to her work. If you’re looking for smart, complex, politically engaged children’s fantasy with excellent storytelling and characterisation, look no further. There’s simply no one better than Frances Hardinge. Cuckoo Song is a novel that reveals its mysteries gradually, and if I were to elaborate further on the story I’d run the risk of taking the pleasure of discovery away from you. As I said above, the first section of the novel terrified me, and some of that has to do with the fact that I was able to join Triss in her fear and uncertainty. If you’re well-read in folklore and familiar with a certain kind of story, it’s probably not difficult to figure out what happened to Triss, but there’s a difference between guessing alongside her and knowing for sure from the get-go. So if you want to read this novel completely unspoiled, you should probably stop reading my post here. Explaining why I loved Cuckoo Song in more detail will require me to give away certain aspects of the plot. Cuckoo Song is a changeling story unlike any I’ve ever read: it uses Triss’ (aka Not-Triss, aka Trista) perspective brilliantly to draw attention to the dehumanisation of the Besiders (the name the fairy folk are given in this world), as well as of anyone who breaks social conventions. This is an outsider’s story, and what makes it stand out is the fact that it’s told with such compassion. 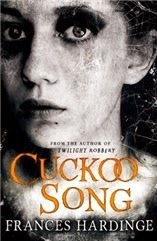 Cuckoo Song starts out very dark, but by the end it’s a little more like a Frances Hardinge novel: fantastic and imaginative and strange, but not necessarily unsettling. I’m not sure if I can do justice to how well-executed this journey away from the pervasive sense of menace that permeates the first third of the novel (and, with it, the widening of Trista’s perspective) really is. Bit by bit, the monsters in Cuckoo Song are shown to have been in the eye of the beholder, and we’re left with human messiness and wrongheaded people who have made awful mistakes instead. ‘But I’m still hungry!’ she exclaimed. There was nothing in her head except need, and it made her angry, terrified and childish. ‘You said I could eat as much as I liked! I’m still hungry!’ Her voice was louder than she intended, but why not? She was desperate. And they had promised her all the dinner she wanted! If they loved her, why was there not more food? ‘No!’ snapped her mother, then closed her eyes and smoothed her own hair. ‘No,’ she added more gently. ‘That... That really is enough, Triss.’ ‘You promised!’ The yell tore its way out of Triss as she jumped to her feet. ‘You promised I could have as much as I wanted!’ She felt impossibly angry, as if she had been tricked into giving full rein to her appetite. Her plate was gripped tightly in her hands, and it seemed possible that she might smash it on the table, watch its little blue-white Chinese scene shatter into bits. Why were her parents starving her? What was wrong with them? I imagined a young girl frightened and on edge, even in her home where she knows she should feel safe. Some keen instinct keeps telling her that there is a monster in the house, and eventually she realises that she is the monster. Like all changelings, she is a terrible child, but she is also a desperate and frightened one. She clings to an identity that is not her own, and helplessly tears it, because her fingers are thorn-tipped. So many gifts, so many friends. But how many of these friends were still in Triss’s life? None, she realized. Her mother had considered some ‘too exuberant’ for Triss’s health, and her father had argued with the parents of others. Somehow, every time Triss had formed a connection, it had been severed. These gifts were the stumps of friendships hacked short. The same happened, we learn, when Triss was sent to school. Her enthusiasm at breaking free from her monotonous life was perceived as unhealthy “overexcitement”, and she was taken away in no time. It’s no wonder Trista finds herself inhabiting the life of a miserable and desperate girl, prone to using whatever small leverage she has to her advantage with no thought of the consequences, and thus deeply resented by her own sister. Speaking of which, the way Trista and Pen (wonderful Pen!) go from enemies to allies, and the way Trista then encourages the younger girl to rethink her relationship with her sister, is nothing short of masterful. Somehow the safety of another person, a smaller person, had been thrust into Trista’s hands. It frightened her. She wondered if mothers felt scared at having so much power over their children. Perhaps they did. Perhaps they wished there was somebody to tell them if they were doing things wrong. She felt a sudden, unexpected sting of sympathy for the Crescent parents. That dreadful girl. It was the only name Violet Parish was allowed nowadays in the Crescent household. The nature of her dreadfulness had never been openly discussed in front of Triss, but she had pieced together a little from her parents’ veiled remarks. The word they used a lot was ‘fast’, and Triss did not think they were talking just about the motorcycle. Violet did look fast, Triss reflected, lean like her motorcycle, pared to the sleek basics, with no softness to slow her down. Even her bobbed hair had sharp corners. ‘I can’t believe how cold she is,’ Triss’s mother said, peering fearfully out through the window. ‘Could you ever think that was the same girl?’ After Sebastian’s death the Crescent family had been braced to catch ‘poor Violet’ in its welcoming and supportive arms, but Violet had failed to reel or fall back into them. Instead of going into a proper, decent mourning, she had hacked off her hair, then started smoking and wearing dresses that let men see her calves. She had also started bothering Triss’s father for money, and Triss’s mother always shook her head and murmured about funds squandered on cocktails and ‘the high life’. Triss let her hand rest against the inside of the front door, almost expecting it to be chilly to the touch. Violet had indeed seemed cold – cold, selfish and ugly. Her visit had ripped a hole in the fragile calm of the house, like the scratch of a careless nail over tissue paper. It had torn away the last remaining shreds of Triss’s brief sense of joy. She had seen herself through Violet’s eyes, a pallid, simpering accomplice of her father’s claims. ‘Oh no, of course I couldn’t possibly understand you.’ Violet’s shadowed face seemed to be wearing a grim and serious smile. ‘I know, you woke up one day and found out that you couldn’t be the person you remembered being, the little girl everybody expected you to be. You just weren’t her any more, and there was nothing you could do about it. So your family decided you were a monster and turned on you.’ Violet sighed, staring out into the darkness. ‘Believe me, I do understand that. And let me tell you — from one monster to another — that just because somebody tells you you’re a monster, it doesn’t mean you are. ‘Just now you told me what you did because you want me to stop you from eating Pen. If you were a real monster, you wouldn’t have done that, would you?’ Trista’s eyes stung, and she wiped strands of cobweb away with her sleeve. ‘Idiot,’ added Violet, for good measure. Violet, Trista, Pen and Triss are all young women who realise they can’t be “good little girls” and who want to live their lives in their own terms. It takes courage, fortitude and mutual support for them to be able to reject the narratives about themselves their families and the rest of the world want to impose on them and live “life as it was, not as anyone said it should be”. What I loved the most about Cuckoo Song was probably the fact that there are no actual monsters within its pages. Like the very best fiction, it opts for empathy even when it’s difficult. Hardinge shows us everything that’s wrong with clinging to a view of the world that dehumanises Violet and Trista, but she does so without creating other monsters in her turn. The Crescents, the Architect, even the terrifying Mr Grace: all of them are frightened and lost and utterly wrong, but they’re not monsters. We get a glimpse of the human motives that got twisted by fear or grief or self-serving beliefs. Trista’s eyes stung with dust, and joy, and the cobweb tears that she was beginning to accept. Her lungs and mind were full of life – life as it was, not as anyone said it should be. There was an invisible necklace of nows, stretching out in front of her along the crazy, twisting road, each bead a golden second. She had no idea how many there were. Perhaps a hundred million of them, perhaps fewer than ten. And she laughed, knowing that with every risk, every corner they took at speed, the necklace could be broken, its beads spilt and lost in the gutter. All was perhaps. Nothing was certain. And that, that was wonderful. ‘Don’t you dare!’ snapped Violet, then sighed and gave Pen a gentle exasperated look. ‘Pen... money only seems like a mean reason if you’ve never had to think about it. Most people have to think about it all the time. Money doesn’t mean cake and diamonds; it means finally paying off what you owe to the landlord, the baker and the tally man. It means having coins for the gas meter, so you don’t have to chop up your shelves for firewood. It means keeping the wolf from the door for a while. The War crushed faith. All kinds of faith. Before the War, everybody had their rung on the ladder, and they didn’t look much below or above it. But now? Low and high died side by side in Flanders Fields, and looked much the same face down in the mud. And the heroes who came back from hell didn’t fancy tugging their forelocks as they starved on the streets. wow this sounds amazing. I've never read anything by Frances Hardinge so I know where to start now. "historical setting with fantasy and folklore elements" sounds right up my alley. Okay, I bypassed the spoilers because this sounds like a book I would enjoy. Off to add it to the wish list. Everything you have said makes me want to put this book in my brain ASAP. (Not INSTEAD OF A Face like Glass; in addition to.) I am constantly complaining that there aren't more changeling stories in the world -- did you ever read Eloise Jarvis McGraw's book The Moorchild? That one's also about what it would be like to be the changeling. Try it! I'm going to put this book in my brain too (love Jenny's turn of phrase) but I'm afraid parts of it are already there. I was a hungry, rapacious tantruming child, and the description of how Triss feels reminds me of how it felt to be inside a tantrum. Oh Ana, you are killing me! You have no idea how frickin' badly I wanted to read this whole post, but I was strong strong strong and stopped before the spoilery bits. I'm ordering it immediately! I still haven't finished Fly By Night, but oh my goodness, Ana, I so easily understand why you've fallen so hard for Frances Hardinge. Even before having finished my first book, I do believe she shall enter my list of favorite authors. I have to read this now! You had me at the point where you found the book terrifying. Add to that folklore and fantasy bits and well, I'll be getting this asap! Thanks for a lovely review of a book I might not have read for years yet :-) You are genius sometimes, Ana!